It’s hard to find good information about food. Myths and mis-information are everywhere. 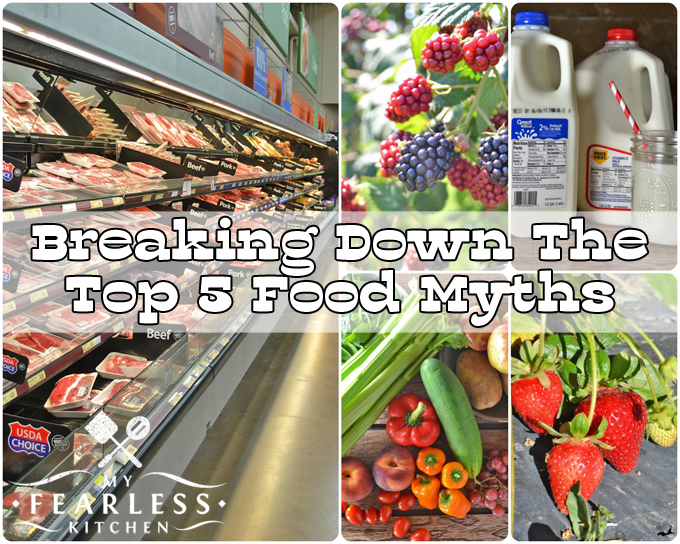 I’m breaking down the top 5 food myths for you right here. What are the Top 5 Food Myths? Everybody ranks them a little differently. Here are my top 5. 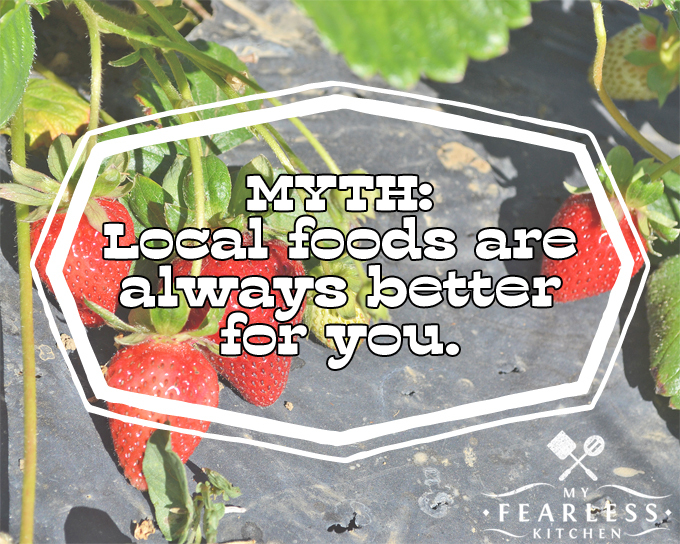 Myth 1 – Local foods are always better for you. TRUTH – There is no nutritional difference in foods grown locally compared to foods that are not grown locally. A few summers ago, I had the chance to visit a strawberry farm in California. The strawberries we tasted on the farm were so delicious! They were small, tender, sweet and juicy. We asked why the strawberries in our grocery stores don’t taste quite the same. The variety of strawberries that are grown for shipping are larger and firmer. If farms were to ship the smaller softer strawberries, the berries would get squashed during shipping. These smaller strawberries just can’t handle being transported. So farmers grow different varieties of strawberries, depending on what they are planning to do with them. Not everyone can agree on a definition for “local foods.” To some people, it means raised within a 50-mile radius; to others, it means raised in their state. There is no nutritional difference between strawberries that are grown in Indiana (where I live) and strawberries that are grown in California. Different varieties of strawberries may be grown on each farm, and different varieties may be grown for sale in their community than the varieties grown to be shipped to grocery stores. 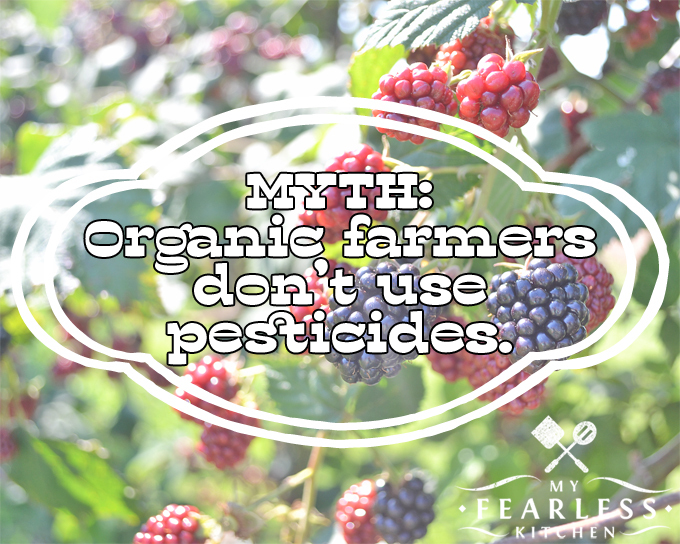 Myth 2 – Organic farmers don’t use pesticides. TRUTH – Organic farmers can use pesticides. We have tame blackberry vines on our farm. They grow the biggest, most beautiful blackberries I have ever seen. We don’t use any fertilizer or pesticides on them. Technically, they are organic, but we don’t label them that way because we are not certified under the USDA National Organic Program. Truthfully, we are just lucky that these blackberries thrive on benign neglect! Organic farmers can use certain pesticides, they just can’t use some of the same ones that “regular” farmers use. Chemicals like alcohols, chlorine, copper sulfate, detergents, ammonium, and sulfur can be used in organic farming. It’s important to wash fresh fruits and vegetables before you eat them – this will clean off pesticide residues or germs that might be on the food. 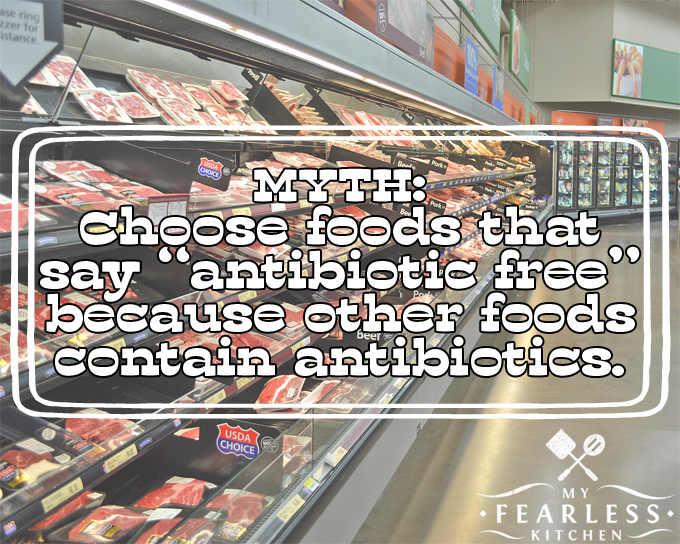 Myth 3 – Choose foods that say “antibiotic free” because other foods contain antibiotics. TRUTH – No meat or milk contains meaningful levels of antibiotics. On my farm, we have only given antibiotics to 1 cow and 1 calf in the 8 years I’ve been a part of this family. When we did use those antibiotics, we kept careful records of which animals received them, how much we gave, and when we gave it. Those animals stayed on our farm until the withdrawal period for the antibiotics had passed. As veterinarians, my family works closely with farmers in our area to decide if or when to give antibiotics to animals. Farmers are responsible for keeping detailed records of the antibiotics they administered. Farmers also need to follow established withdrawal periods after giving antibiotics to their animals. If they don’t follow these rules, they can be heavily fined or not able to sell their products. 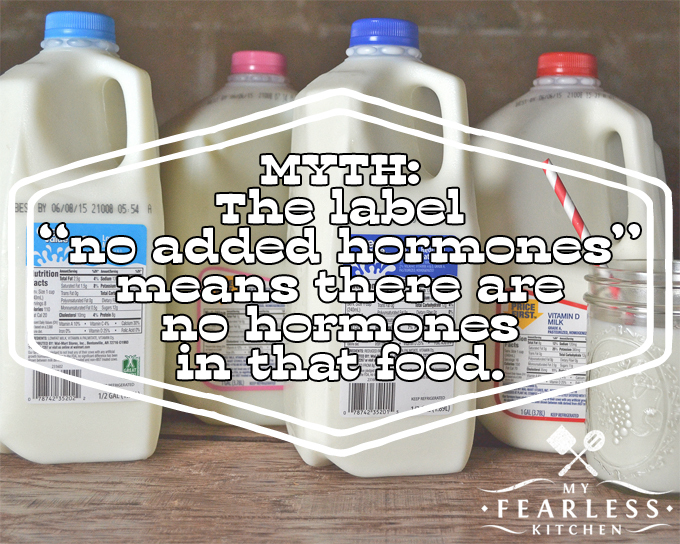 Myth 4 – The label “no added hormones” means there are no hormones in that food. TRUTH – All plant and animal products contain hormones. My son will turn 4 years old in a few months. He’s smart and stubborn (rumor has it, he comes by both those traits honestly). Like many mothers, I worry. I worry about him falling and getting hurt, I worry about how he gets along with other kids at pre-school, and I worry that he won’t be able to stop talking in class (also an inherited trait). I worry that he’s not getting enough sleep. But I do not worry about him starting puberty early because of hormones in his food. This is simply not true. All plant- and animal-based foods have hormones. Plants and animals need hormones to live! There are 5.4 nanograms of estrogen in a 3-ounce serving of milk. There are 1.9 nanograms of estrogen in a 3-ounce serving of beef from a steer that was given growth hormones. Three ounces of kidney beans has 153,087 nanograms of estrogen. And soy flour has the most at 128,423,201 nanograms of estrogen in 3 ounces. My almost-4-year-old son makes about 41,000 nanograms of estrogen every single day. So, no, I’m not worried about hormones in food. And, yes, all food has hormones. 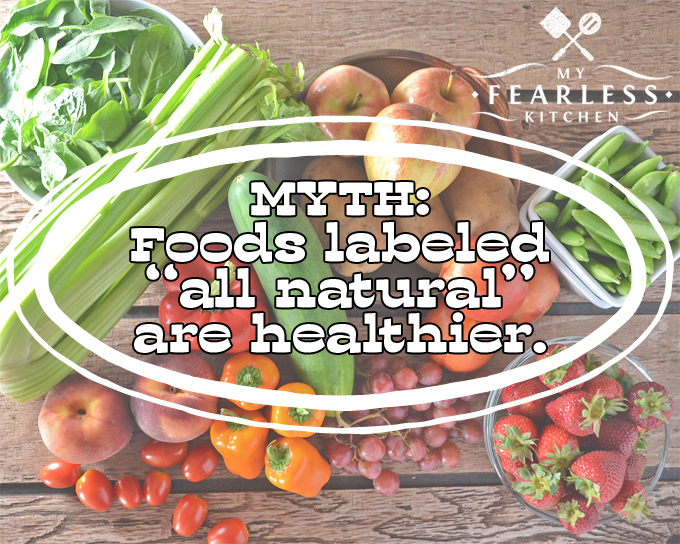 Myth 5 – Foods labeled “all natural” are healthier for me and my family. TRUTH – The “all natural” label has nothing to do with nutrition. I’ve toured grocery stores with a nutritionist a few times. It’s actually kind of fun to get their take on grocery shopping! The overall message is to stick to the outsides of the store as much as possible – that’s where you can find all the fresh and frozen fruits and veggies, meat, eggs, and dairy. These are your most “natural” foods. You should definitely shop the aisles of the grocery store… But think balance when you’re planning meals and shopping, not indulgence. The only time the label “natural” has a definition as a food label is when it is used on meat or poultry. “Natural” means that there are no artificial ingredients or colors added, and the food has been minimally processed. So a hot dog would not qualify as “natural.” But a boneless ham might. What other food myths have you heard? What have you heard about food that might – or might not – be true? Leave me a comment below, and I’ll answer your questions! This was very helpful, thank you so much for all the info.